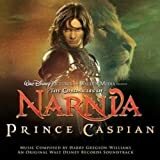 Accueil Produits Bande originale La bande originale de “Le Monde de Narnia : Le Prince Caspian”. La bande originale de “Le Monde de Narnia : Le Prince Caspian”. Sortie : 13 mai 2008. Film : Le Monde de Narnia : Le Prince Caspian. 1. Prince Caspian Flees – 4:35. 2. The Kings and Queens of Narnia – 3:33. 3. Journey to the How – 4:45. 4. Arrival at Aslan’s How – 2:57. 5. Raid on the Castle – 7:06. 6. Miraz Crowned – 4:47. 7. Sorcery and Sudden Vengeance – 6:17. 8. The Duel – 5:56. 9. The Armies Assemble – 2:23. 10. Battle at Aslan’s How – 5:18. 11. Return of the Lion – 4:16. 12. The Door in the Air – 7:53. 13. The Call (par Regina Spektor) – 3:09. 14. The Dance ‘Round The Memory Tree (par Oren Lavie)- 3:43. 15. This is Home (par Switchfoot) – 4:01. 16. Lucy (par Hanne Hukkelberg) – 4:31.